The bed of nails has been used by Indian mystics for centuries in the practice of healing and meditation and now it's been re-invented with a Skandi twist to give you a whole range of benefits, from tackling insomnia and easing stress to helping you re-balance after a long haul flight, alleviating arthritic aches and reducing the appearance of cellulite (the spikes help the body rid itself of toxins and increase blood flow, to assist the breakdown of stubborn fat groupings). It's also brilliant for relieving chronic neck and back pain, and can even have a positive impact on your complexion! Far from being a scary instrument of torture, this Bed of Nails can actually banish aches and pains and help you get a heavenly night's sleep. The makers have cleverly combined oriental history with Scandinavian modernity to create a funky-looking acupressure mat that alleviates tension, stress and back pain. More than 8,800 non-toxic plastic spikes are arranged on the mat and work in a similar way to acupuncture needles, helping release endorphins (the body's own 'happiness' drug) and oyxtocin, to help you stay calm and relaxed. Lay the Bed of Nails on the floor or on a mattress and slowly lower yourself onto it. Beginners should wear a light T-shirt or lay a sheet over the mat until your body and skin get used to the spikes. Initially lie on the Bed of Nails for 10 - 15 mins, and as you get used to the pressure you can build up to 20 - 30 mins. Use as often as you need - preferably daily. Don't be alarmed if your skin stings a bit or feels warm and tingly, and it's perfectly safe to fall asleep for a while on the mat. Leaning against it (rather than laying on top of the mat and pillow) is a lighter way to use Bed of Nails while you acclimatise (you put less weight on the spikes when you do). Place the mat/pillow at the back of your sofa, bed or armchair to experience the benefits while building up your tolerance. The nails are made of 100% recycled non-toxic ABS plastic, the textile is cotton. The Bed of Nails should not be used in case of skin disease, haemophilia or the intake of anticoagulants. Finally an awesome product. I suffer from back ache during the cold, and I bought this last year and have been using it ever since. It has done wonders to my back, I lay on it just before bed and the tension from the day goes away. It is very relaxing. I bought one for my mum too and she loves it! Proper relax for my aching back. 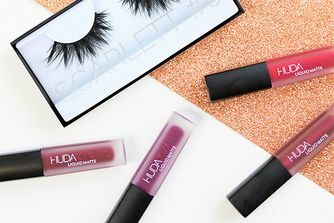 I had been looking at the BON range for a while; after finding them here on Cult Beauty. After suffering with mild backache, I was desperate to try anything and took the plunge and I am SO glad that I did. I find the whole experience very relaxing and try and fit in at least 10 minutes a day to use my mat, I really look forward to using it. I've told everyone who will listen about it and my Mum is now interested in her own after stealing mine for several hours! I know that there are cheaper mats out there but I wanted to be sure that I had a safe product and felt reassured by Bed Of Nails. I now hope to complete the collection. Both this and the pillow are incredible products. I use this during my breaks (in between sitting at a desk for several hours). Gives the same effect you get after a shot of espresso, but you also feel extra calm. Mind-blowing! As strange as it is, this is the best thing I’ve ever bought. The price made me question the purchase initially, however upon receiving and the first try, it was obvious that I made he right decision. It’s slightly painful when you first lay on it, however if you stick with it you will see a huge improvement. Using this mat everyday. It helps to reduce stress, relax, clear mind. The mat is so amazing and helpful that my mum and grandma asked to order two more. I drive a lot for work and was looking for something to help reduce the tension and stiffness I often started to feel. I found that it really helped me to relax and I slept incredibly well - not even realising I wasn't sleeping well in the first place. I have this and the pillow and find this much better, although after long days having to stand (I work a lot of events), the pillow is great for your feet! This is really great! It activates immediately circulation, especially useful for sedentary workers. I will buy a second one soon as a present! :)Thanks Cult Beauty - you rock! I must say, I was a bit skeptical to try this at first but I had developed such unbearable lower back pain all due to stress. Let me tell you, from day 1, I could feel the difference. Although at first, I could not use it daily as I live a busy life and am a single mother raising two small children, I now make the time to use it at least every other night for 10 minutes after my hot bath. The lower back pain is gone now, it has helped me lose weight, I feel more able to take the stresses that life throws at me as it makes me serene. From the minute I lay down on it, it plunges me into pure bliss. I almost fall asleep. In fact, once, when I first started using it, I had woken up during the middle of the night with my usual lower back pain and when I lay down on it and crawled into bed, I fell asleep for over an hour. When I woke up, my pain was gone. Although I work out regularly and try to watch what I eat, I feel it has become an essential part of my routine and I can now not live without it as it benefits a lot of areas in my life. It is one of the best things I have purchased and I highly recommened it. Also, before I forget, I have always from the begining tried this mat bare back. Although at first it feels uncomfortable at first but you soon get used to it once you stop moving around and you will feel total bliss. Buy this product if you have problems sleeping, relaxing, if you are prone to aches and pains. I have all of the above and am loathe to take conventional medicine, so am always on the lookout for an alternative. I swear this worked from Day 1. I even stopped using it for a night, to see if it was mind over matter. I sleep like a baby- truly drifting off almost immediately. My neck and back pain is much improved. It is indispensable, in my opinion, and I am thrilled to have found it. Word of advice- dont go bare back! Wear a thin layer of clothing. It is not too uncomfortable, and takes only a little while to get used to. Takes a while to get used to, but after a couple of times, you’ll fall in love with it. Definitely seems to make a difference and my back craves it by the end of the day. This mat is awesome. I have both the acupressure mat and pillow and I use them probably every other night, though I should ideally use them every night before bed. Lying on these spiky things may seem scary but it won't hurt, in fact, it helps you feel more relaxed. I noticed that I sleep way better through the night whenever I used the mat and pillow. Great investment for your well-being!!! My husband was given this for Christmas but we didn't realise that you aren't supposed to use it if you are on blood thinners. So obviously, I took it over. 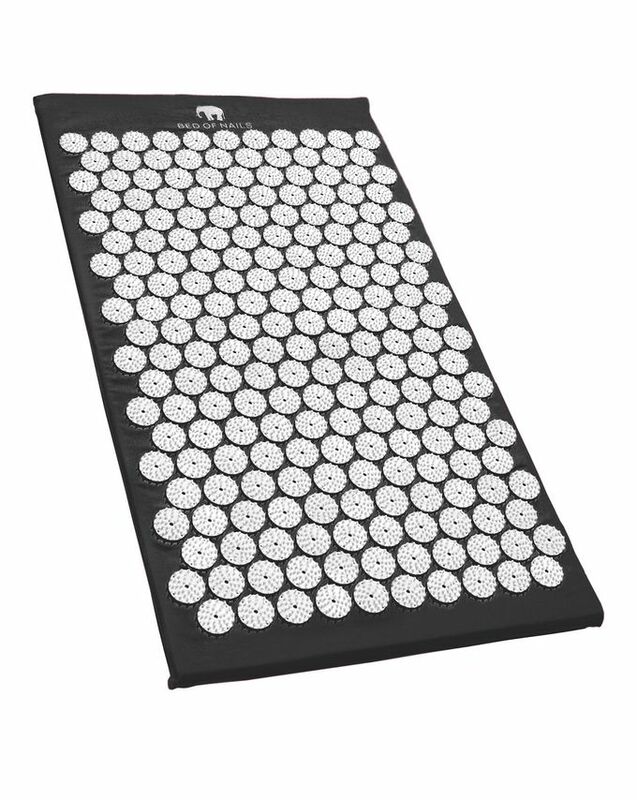 As well as all the things the other reviewers say (in a good way), I have very itchy skin and lying on the mat enables me to massage the itches away and it becomes so comfortable that you don't even realise you are lying on a bed of nails!! If you have an 8 hour, sitting at your desk job, you need it! If your have back pain, neck pain, you need it! I personally love this and find it the most relaxing thing I've ever bought. It gives you a great heating sensation when you lay on it and can actually feel the paiful area pulsating and nothing, NOTHING compares to the feeling you have when you peel yourself off it. It melts the tension away. This is a really great product! I bought it for me and for one my friends because we work quite often long hours in an office, not moving from those office cubicles and the tension is really building up in the muscles. I go to the gym in the morning not to be a sedentary person but it does not help with the after work feeling. Using this every evening before sleep, on bare skin, for around 20 minutes works wonders, relaxes my muscles and helps me sleep so well afterwards! I truly love it. Having tried most things for back pain, I thought I would give this mat a try but was skeptical as to how much of a difference it would actually make. Now you can hardly get me to shut up about it! 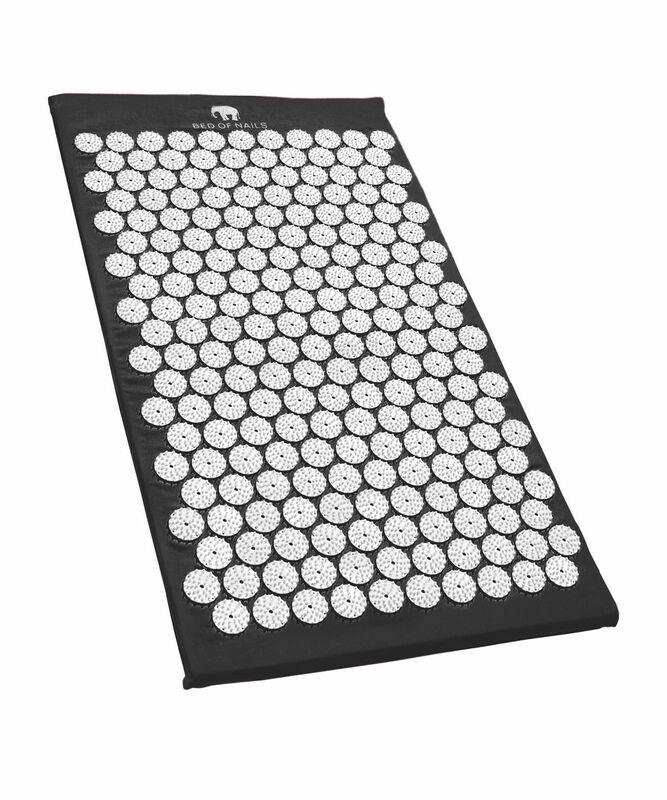 Using this mat for just a short period of time, a couple of times per week has made a huge difference to the pain in my back in ways I haven't been able to achieve through any other (and much more expensive!) methods. And it's not just my back that it has helped - there has been a visible improvement to cellulite (who knew it could be so easy to make it disappear?! ), headaches, skin... need I go on? If you haven't yet bought one, trust me, you are missing out! This is one of those products that you think you don't need but decide to give it a whirl anyway in the hope of shedding years of pent up stress. After getting used to the strange sensation of lying on it and a bit of wriggling around to get comfortable (as the other reviews suggest light clothing is best) it's surprisingly good - in fact I've fallen asleep on it several times. I'm not sure what it does but it does seem to work really well. Being Swedish I was first introduced to this wonderful thing in 2007 when it was the "Chrstmas present of the year". I suffer from really bad tendonitis, and on the occasions where the pain is unbearable, I take 20 minutes and lie on this mat. At first its obviously very sore, but you get used to it and the benefits are great! I also bought the pillow but I find myself using the mat a lot more often! Brilliant product that acts more or less like acupuncture ! I bought it twice both times as presents. My friends really happy about the ACUPRESSURE MAT! I want it too ;) Just waiting for the black one to arrive! I have had chronic back pain for about five years now, and I've tried everything in the book. Ultimately, it seems to me, if you have back pain that won't shift, the only thing that will make life more comfortable is limitless money, because the remedial comforts that work - like massage, acupuncture, osteopathy etc provide short term relief at a high cost. Consequently, I am always on the lookout for ways to achieve the same, short term, symptomatic relief - for when I really need it - without having to fork out to go to a specialist. This mat, I am thrilled to say, appears to do just that. I've only had it a day, so I can't speak for the long term, but it has been great so far. As acute back pain is usually the result of muscle spasm or chronic tension, it's difficult to fix on your own because the pain won't let you relax, and yet relaxation is the only way out. What is brilliant about the mat is that the spikes overstimulate your skin and distract you from the pain, so instead of only being able to think about that one spot that is agony, your brain gets confused and that one spot melts into a general sensation of your entire back against the spikes - a feeling that is oddly, quite nice and very difficult to describe! Warm and prickly - in a good way!! I suppose the best parallel is the way a hot water bottle can soften the edges of very localised pain, except I think this works better. I'm really impressed, and curious about the pillow version!